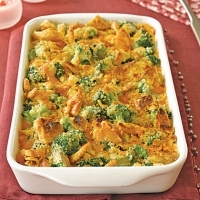 Mix all together, except croutons or stuffing. Pour into casserole dish that has been sprayed with Pam. Bake in oven, uncovered, until it bubbles, about 30 minutes. Put stuffing on top at beginning of cooking. Bake at 350°. Serve hot. 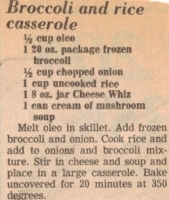 This recipe may be cut in half. 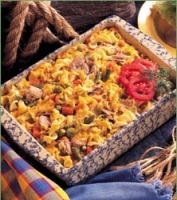 Recipe categories: Side dish, Vegetables, Casseroles.